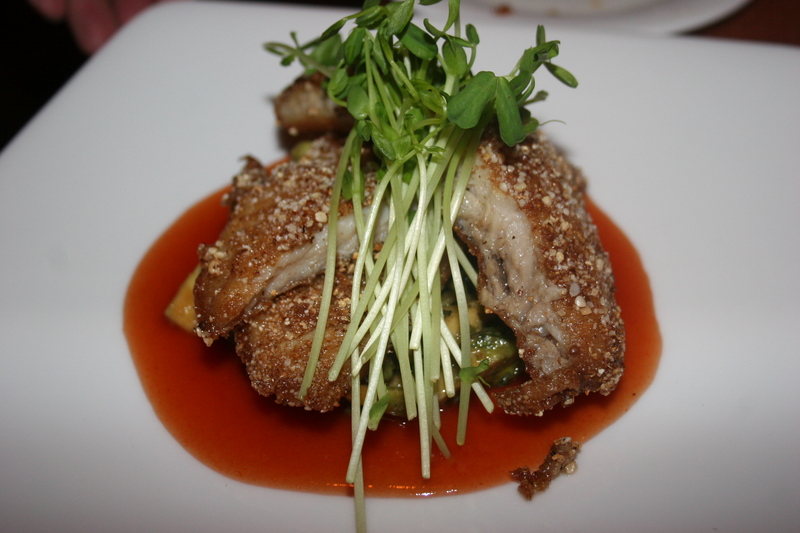 Blackbird Restaurant in Collingswood, New Jersey is one of the highest rated restaurants in South Jersey. It’s hard to believe I had never been there but prior to tonight, I had never been there. That is no longer true. 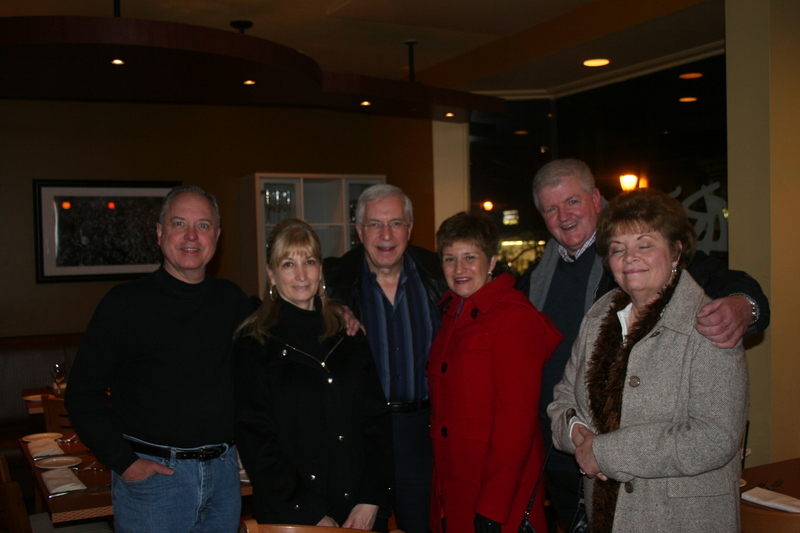 My wife, Kathy and myself along with boyhood friends, Ange C. and Val S. and their lovely wives, Arlene and Patty descended on this gourmet establishment prepared to be as critical as possible while still keeping an open mind. First of all, it was nice to see everyone. It’s always a great time to get together with these four and listen to Val’s stories from both the distant and the recent past. As usual, the Crown Prince of DooWap did not disappoint. 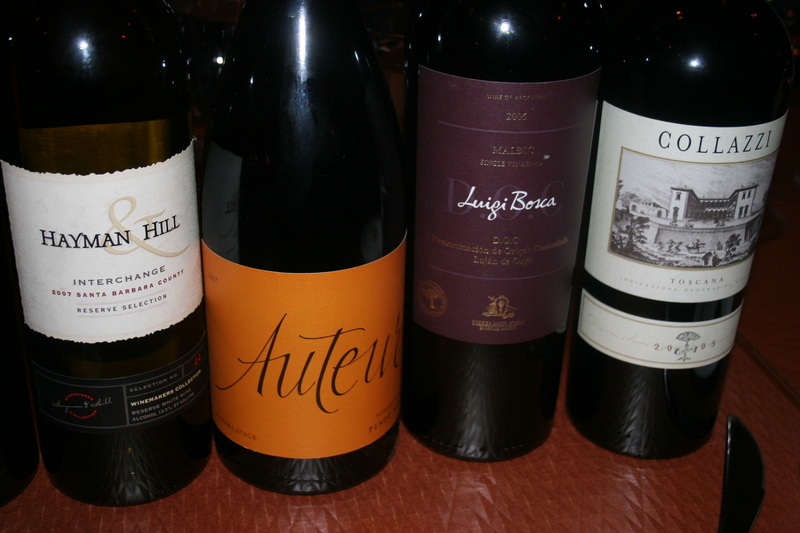 The six of us had some nice wines and we were all hoping our choices would compliment the food we were about to enjoy. I had brought the 2007 Auteur, Sonoma, Pinot Noir. Everything I had heard about Auteur wines said they needed lots of time open to reflect their true flavors. I uncorked this bottle on Friday morning and left it in the fridge until it was time to go to dinner. The wine was a dark ruby color, much darker than most Pinots and actually drank more like a cabernet. Great, intense flavors that gave a rich mouthfeel and a lingering finish. It’s the kind of wine that you wish you had a case of in reserve. Val had brought the 2006 Luigi Bosca, Single Vineyard, Malbec. This was an excellent wine with a soft bouquet of ripe black fruits. One taste and you knew this was a special Malbec with smooth texture and huge flavors of fruit, leather and even some caramel notes;just a very nice wine from Mendoza, Argentina. Ange brought another outstanding wine, the 2005 Collazzi, Toscana. This Super Tuscan was rich and alluring with deep berry flavors mingled with tobacco and cedar and a nice compliment to our meal. As we drank we listened to our waitress, Noel describe the “specials” of the evening. 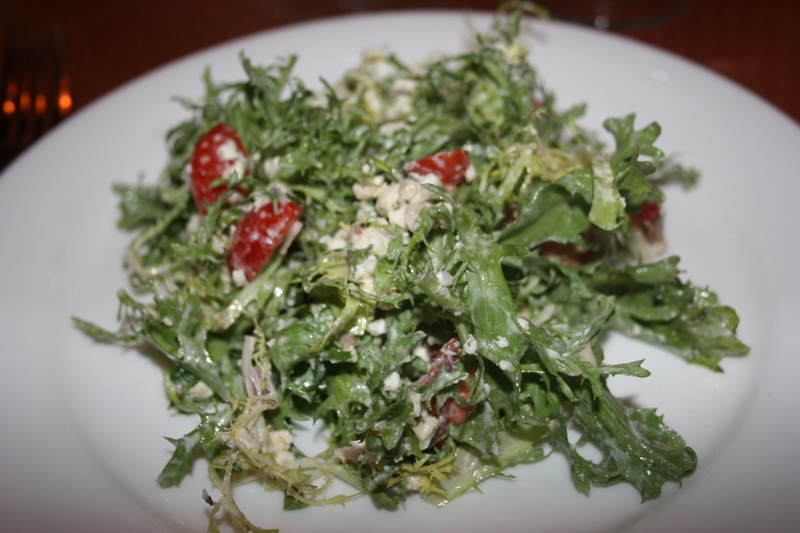 I started with a Frissee Salad, with baby tomatoes and topped with goat cheese and it was delicious although I found the greens somewhat difficult to swallow due to their texture. It had great flavor, though and it might have my throat’s fault so let’s say that was my problem. 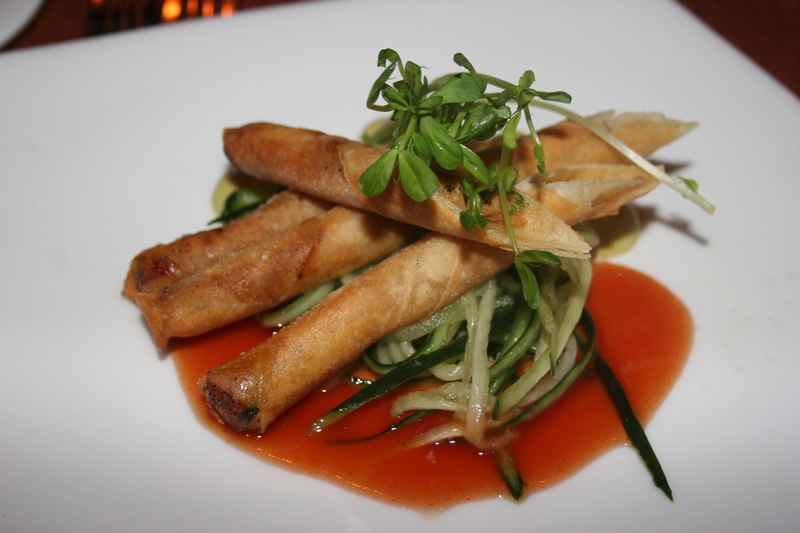 Patty had the Thai Chicken Spring Roll, spicy mustard and chili sauce. They looked scrumptious and had it not been a Lenten Friday I think this would have been my choice to start the meal. 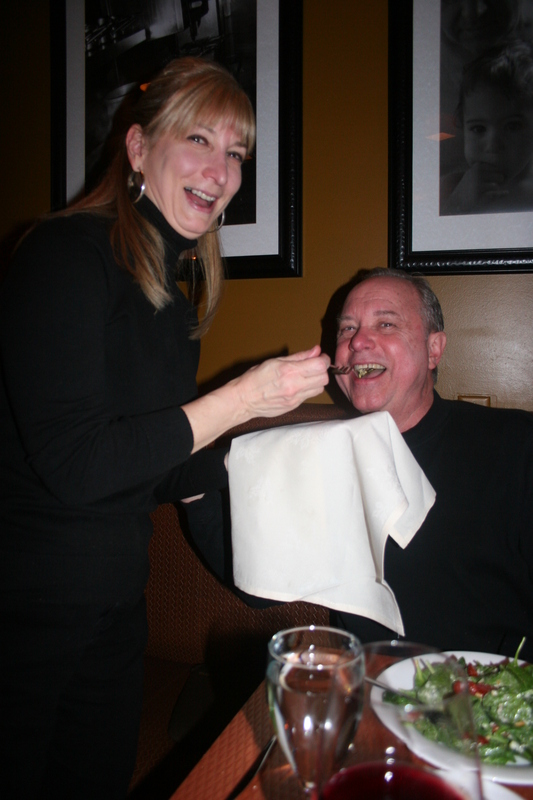 When you are the Crown Prince of Doo Wop you expect someone to hand feed you your food and thru the years of their marriage Val has carefully trained Patty to provide this service for him. In the picture you can see how this training has paid off. Now if he could just find someone to hold the napkin for him he could totally concentrate on the eating portion of the act. By the way, Val DOES chew his own food without assistance, yet. Although I don’t have a picture, two people in our party had the Prince Edward Island Mussels and described the juice as “phenomenal” and requested extra bread for dipping. Regrettably, I never acquired a taste for mussels. When the “specials” were being recited I had focused on the “Diver Scallops”. When it came time to order it was announced that the “diver scallops” were gone, finished, outta here, consumed by hungry diners whose only claim to fame was that they had arrived at Blackbird prior to us. You would think that would be bad news as this was going to be my entree. As it turned out, this was fantastic news because this forced me to change my choice of entree. I will admit that the Handmade Potato Gnocchi, fresh mozzarella, tomato and basil sauce topped with lump crabmeat pictured here does not look like the finest meal you have ever seen. Don’t be fooled though, it was absolutely FANTASTIC and one of the best tasting entrees I have had since I started this blog. 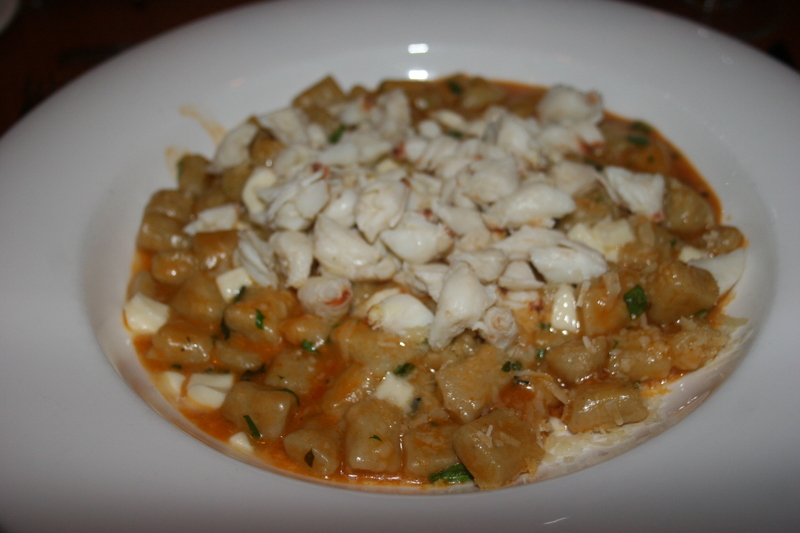 The flavors are incredible, the sauce, sheer perfection and the crab meat sweet and tender. I am so grateful to the diners who chose the Diver Scallops before we arrived! Pictured above are some of the other entrees enjoyed by our party. 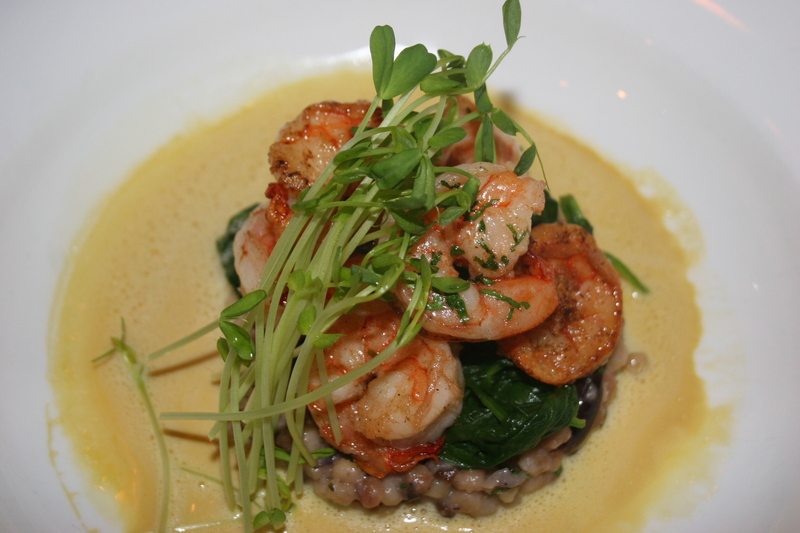 The Sauteed Gulf Shrimp, olive and mascarpone, fregola sarda and saffron sauce. The Pan Roasted Atlantic Salmon, French green lentils with smoked bacon and Provencal sauce, and the Coriander and Rice Encrusted Tilapia, avocado salad, sweet and sour sauce with seafood wontons. 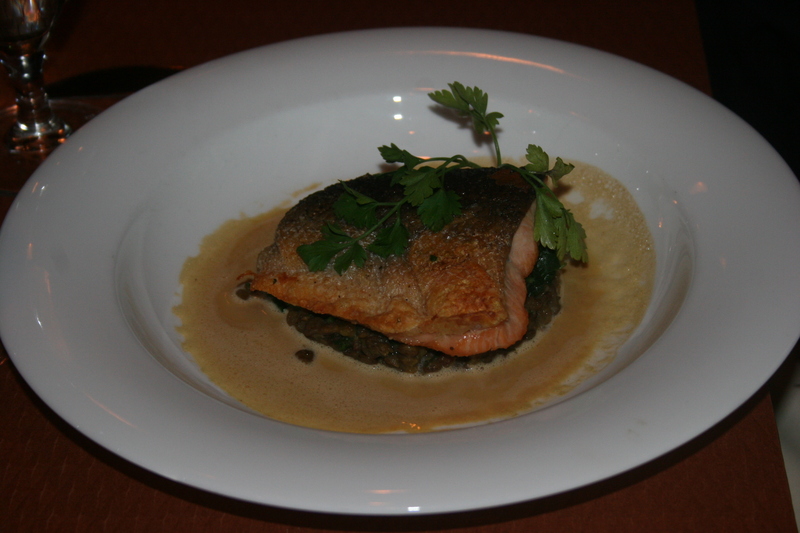 The only real comment I remember is that my wife, Kathy felt the salmon was very good but not on a par with the salmon she had last week at LoBianco’s which she had described as “the best salmon she had ever had”. It’s tough to improve on that! Val ordered what I would have probably ordered had this not been Lent. 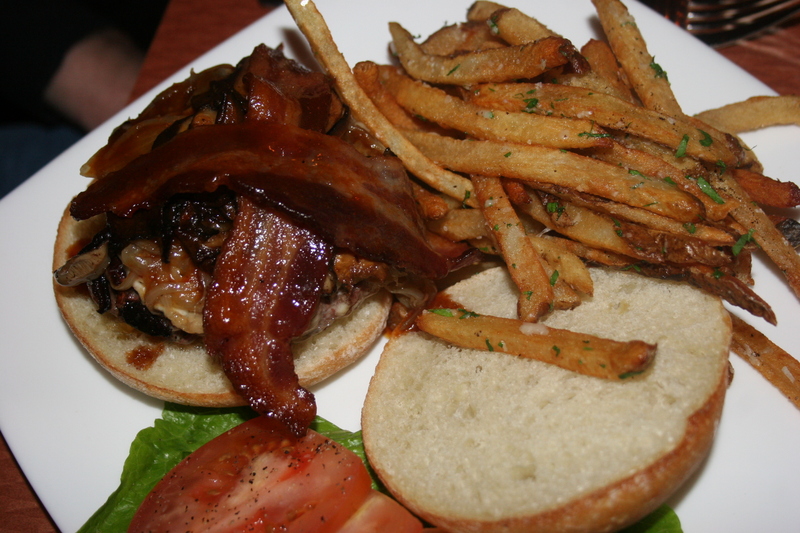 The Wagyu Beef Burger, applewood smoked bacon, carmelized shallots, morel mushrooms, veal sauce with truffled pom frittes. It looked delicious and I did manage to steal a fry while Val was deep into another one of his stories. It’s probably Patty’s fault that she was busy with her own dinner and didn’t find the time to feed Val a bite or two when he paused from one of his tall tales. I am sure Patty paid a heavy price when she got home for her performance. 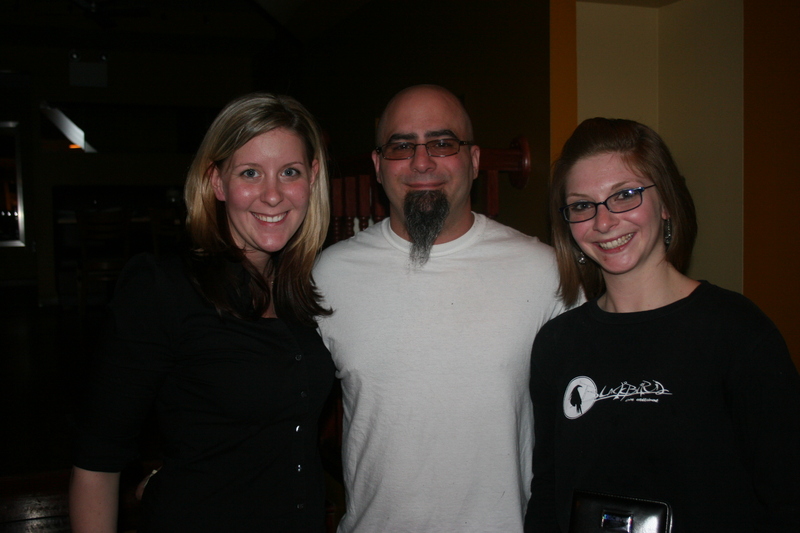 Owner/Chef Alex Capasso, pictured here with Blackbird’s Manager (apologies, her name I did not get), and our waitress for the evening, Noel (bubbly, knowledgeable and attentive all evening), is a Collingswood resident and he can be rightly proud of the acclaim that his restaurant has garnered throughout the state. The six of us enjoyed a wonderful evening and will certainly return in the near future.